1. 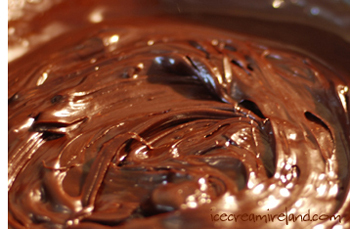 Melt the butter and chocolate in a double boiler over simmering (not boiling) water. 2. Add the cocoa and stir until it is completely integrated. 3. Keep the chocolate mix warm in the double boiler. 4. Combine the sugar, milk and cream in a saucepan over medium heat, stirring until the mixture boils. Remove from the heat. 6. It will clump at first, and it may separate, but keep adding a bit of the milk mixture and stirring it in until theÂ sauce is glossy and smooth. 7. 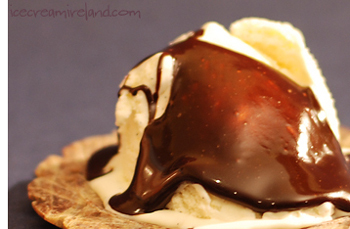 Serve the fudge sauce warm over ice cream! Almost everything we do centres on making our customers happy, and we pride ourselves on doing so. Recently, however, we have been getting feedback from more and more customers who are angry about something that is out of our control – road signs. Dingle is in the Gaeltacht (designated Irish speaking area), andÂ road signs within the Gaeltacht are in Irish only (rightly so, in my opinion). However, when tourists arrive in Killarney, Tralee, or Farranfore, which are all outside the Gaeltacht, most of them are looking for the town of Dingle. They don’t know about An Daingean. The Irish language is a valuable asset to the area in many ways, including tourism. Tourists will have exposure to the Irish language when they arrive in West Kerry, and it will enrich their experience. 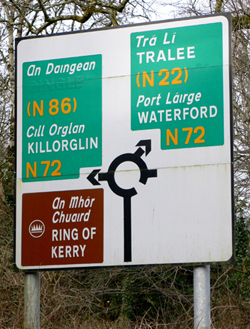 The purpose of road signs in Tralee, Farranfore and Killarney, however, should be that tourists do arrive and do so as quickly and easily as possible. What sense does it make to remove the Dingle name from signs outside of the Gaeltacht without any coordination with maps, guidebooks, GPS systems, etc.? We are dependent on tourism in West Kerry, and the signs are confusing many of the people we are trying to attract, making their first experience of the area a negative one. 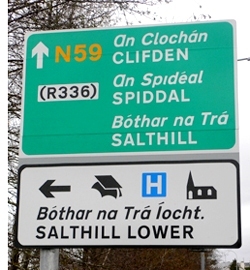 Signs are bilingual elsewhere in the country outside of Gaeltacht areas (see photo right), and I cannot understand why the same can’t be true in Kerry, at least until there is agreement on the town name and full coordination with all relevant publications. In the mean time, if you’re heading this way, make sure you have a good bi-lingual map – one that has the Irish names of towns in a legible font size. Better still, get a GPS. You’ll find “Dingle” listed on all of them. 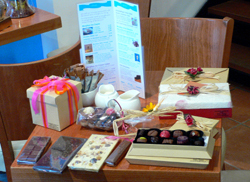 We’re into Lent (a Teutonic word meaning simply “Springtime”), but it certainly doesn’t seem to have made any difference to our customers in the Dingle shop, where we had a huge day today, serving out lots of chocolate, coffee, ice cream, etc. Of course, I don’t have any problem with that, since fasting traditionally meant giving up meat, and we have none on offer. I wrote about sweets and Lent last year (here), and I don’t think I’ll add more except to say that there cannot be any doubt in my mind about hot chocolate being perfectly ok during any fast, since the Vatican made a pronouncement in 1662, allowing it (more here). We had a baking day in production with 6 of us, working on new recipes and combinations of flavours for cakes for the shops. It's really one of my favourite things, playing with taste and coming up with new combinations. I think the winner was our take on an Irish coffee cake - a chocolate sponge (with me, there always should be some chocolate)Â with a layer of whiskey cream, frosted with coffee cream. 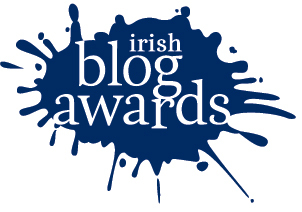 Keep an eye out for it in Dingle and Killarney! And thanks, thanks, thanks to all of you who voted! Your vote did count! I do love this business! Easter is still a ways away – we are not even into Lent, but this morning, when I went into our Killarney shop for a staff meeting, there was a full array of chocolate Easter products on display. These were Lorge chocolates, and Benoit Lorge himself was on hand to explain his line to us and to supervise tasting. Not a bad way to start the day! 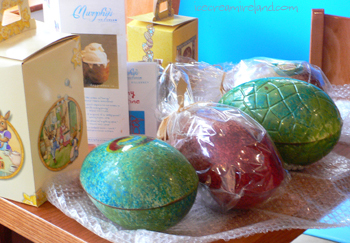 His Easter eggs are huge, and he has them available filled with chocolate pralines and unfilled. The prices seem quite reasonable given the size and decoration (€10-30), and I’m sure they will be a success. Lent might seem even longer this year! We also made champagne sorbet, and even some pink champagne sorbet for our shops to make the day special for our customers. Whip some cream and once it is firm mix in some crushed or pureed raspberries or strawberries until they are completely incorporated. 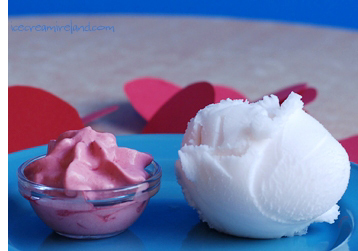 It gives you a dramatically pink cream for decoration. And even better, it tastes good too! 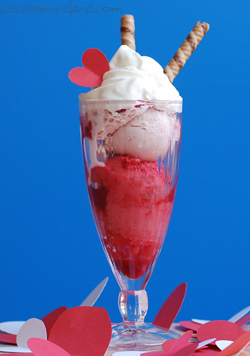 Here at Ice Cream Ireland, we’re fans of Valentine’s Day, which is coming up fast. Love is always a good thing to celebrate, and loved ones can always use the extra attention. Besides, any tradition that involves eating chocolates is a tradition I can happily get behind. Valentine’s Day is probably based upon the Roman holiday of Lupercalia, a fesitival celebrating the Goddess Juno Februa. The name probably comes from Lupus (wolf in Latin) in honour of the wolf that suckled Romulus and Remus, who are credited with founding the city. It is said that one of the traditions including men randomly picking love poems (written by women) from an urn, and thereby selecting their partner for the duration of the festival. In 496, Pope Gelasius I declared the 14th of February a feast day in honour of St. Valentine. Which Valentine is a bit of a mystery, as there were at least three St. Valentines, at least two two of whom are thought to have been martyred on February 14th (possibly the most important of the three was a Gnostic Christian in Alexandria, who wrote and preached about love). The relics of one of the St. Valentines (Valentine of Rome) were given by the Holy See in 1836 to the Whitefriar Street Carmelite Church in Dublin, where they are stored. Or Is the Day Norwegian? In Norway, this time of year is dedicated to the god Vali, son of Odin, and called ‘Lios-beri’ or light bringing. Vali was worshipped as an archer and said to be the awakener of tender thoughts and the patron of lovers. The earliest surviving Valentine’s is a poem by Charles, the Duke of Orleans, to his wife, written while he was imprisoned in the Tower of London in 1415.
Who Made It About Chocolate? 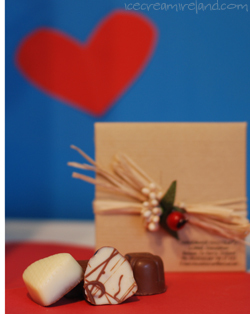 The first Valentine’s chocolates were marketed in a heart-shaped box by Richard Cadbury in 1861. Solid chocolate as we know it was a recent invention at the time! 1. Spice Things Up: Make the Aztec Hot Chocolate. Both chocolate and chilli peppers are generally thought to be aphrodisiacs. 2. Go Over the Top: Champagne Sorbet will always get a bit of attention. 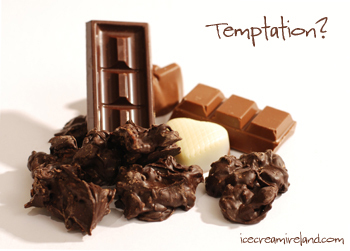 Serve it with fresh fruit or chocolates. 3. Get in the Spirit: Be creative in serving up some ice cream with alcohol such as the black and white cocktail, though that one might need a bit of colour! 4. Feeling Saucy? 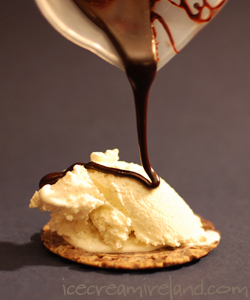 Make some chocolate sauce. Use it to dunk fresh strawberries. Of course there are other uses for chocolate sauce, but that is none of my business! 5. 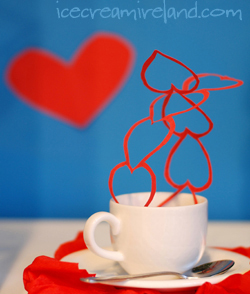 Chat them up: Take time for a romantic chat over a cup of coffee. Naturally, bring out the chocolates. For an extra bit of sweetness with your coffee, try an affogato.